2 How Do You Know If There Is A Tracker On Your Car? 4.1 Where is the best place to put a GPS tracker on a car? GPS tracking devices are now commonly used by consumers for auto-theft security, or to track high-risk drivers such as newly licensed teenagers or senior citizens. The same location-based technology is also critical in assisting businesses with GPS fleet management applications such as routing, mileage documentation, and job costing. The truth is GPS tracking systems are now frequently called upon for a variety of reasons, leaving some drivers concerned a GPS tracker might be attached to the vehicle they operate. That same wonderment also results in the following question being asked: Is it illegal to track someone without their knowledge? First of all, it is highly recommended that anyone who believes they are being tracked illegally to contact the proper law enforcement authorities. Secondly, if a person believes a GPS tracker is on their vehicle they should start by scanning the automobile and searching for the most popular places GPS tracking devices are placed on cars. How Do You Know If There Is A Tracker On Your Car? 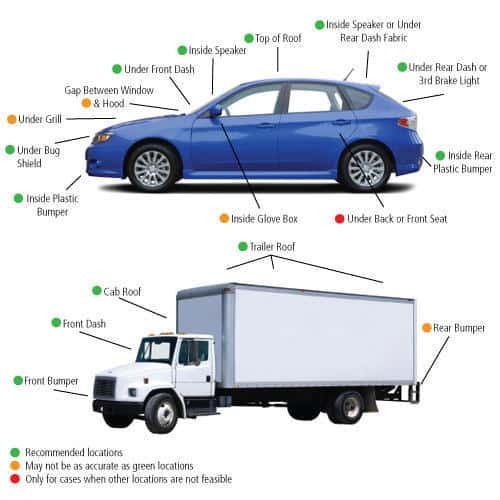 GPS tracking devices are manufactured to connect to an OBDii port, be hard-wired to the vehicles’ 12-volt system, or operate as a stand-alone, portable solutions. GPS trackers (real time systems or GPS data loggers) can be placed on a vehicle in a few different ways. First of all, it is important to understand that the best GPS trackers are now designed as waterproof, compact solutions with exterior magnetic mounts. These design features allow users to easily place a GPS tracking device on the outside of a vehicle covertly, or hide the GPS tracking system inside the cab of the vehicle. Common hiding places for GPS trackers inside a car are underneath a seat, inside the glovebox, stuffed between a seat, in the pouch behind a seat, or inside the center console. However, the most popular place where GPS tracking devices are placed on cars is actually on the outside of the vehicle. Specifically, underneath the target car. This is because GPS trackers are engineered with highly sensitive internal antennas that can pickup GPS signals reflected off the ground! Where is the best place to put a GPS tracker on a car? Placing a GPS tracker underneath a vehicle is good for covert applications, but leaving a GPS exposed to the elements and other outside variables can lead to potential problems. Therefore, people wanting to know where is the best place to put a GPS tracker on a car should research tracking devices that connect to the OBDii port. The reason the OBDii port is often described as the best place to put a GPS tracker is because this location allows a user to never worry about battery-life. This is because GPS trackers plugged into the OBDii port pull power directly from the vehicle! Not to mention, OBDii port tracking devices are both cost-effective and not easily visible by a driver, making them ideal for small businesses. GPS tracking devices that plug into the OBDii port are classified as real time GPS trackers and therefore require a a monthly subscription fee. GPS tracking systems are used every day by hundreds of thousands of businesses and consumers, making GPS tracking a multi-billion dollar market. Therefore, it is very likely most people have driven in a car that was being tracked by GPS. However, those who believe they are being illegally tracked or wondering if it is against the law to put a tracking device on someone’s car should contact an attorney, police officer or both.